Though new to many in the USA, British airbrush artist Paul Mellia has spent 30 years creating original art in a style admired by all who collect his work. 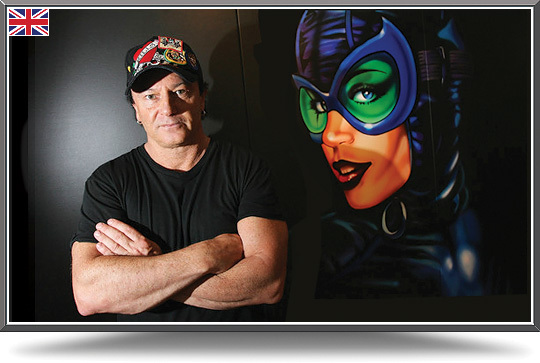 Born in Edinburgh, Scotland in 1958, his family moved to Essex, England, where Paul began drawing comic book characters at the age of four. He was born with dyslexia and explained: "I couldn't read the stories because the words were jumping around. I wanted to draw the story to make it look more real to me. From a very early age I was able to paint them in fine detail. I wanted to make them real, and also show a slightly different side to them." Paul was offered a dream job by Marvel Comics after it spotted his 'individual and very special' three-dimensional style. In 2006, Mellia became officially licensed to portray their comic book characters: Spiderman, The Hulk, Silver Surfer, Fantastic Four and many other superheroes. Paul is also the first and only artist allowed to create Thomas and Friends in the interruptive style to celebrate the 60th anniversary of Rev. W.V. Audrey’s well-loved characters. Paul graduated with honors in design, art, and production at Southend College of Art in England. He was influenced by American movies of the ‘50s and ‘60s which ignited a passion for classic American cars and bikes. Years later, Paul would admire his American dream cars and bikes breezing past his studio in Hollywood. The characters who drove these cars—from young rock stars to old hippies—all had a wonderful story to tell. Paul knew he had to paint these American icons and his whole collection was sold in the first week of exhibit to a private collector from England. Paul remained a number of years in the USA working on private commissions for celebrities like Lisa-Marie Presley, Seal and Tommy Lee. An exhibition of his art at Sunset Boulevard Gallery in Hollywood sold out in two weeks. His work has sold for as much as $100,000. Paul returned to the UK to establish a studio in London. His opening show—‘Kapow!’—of superhero artworks drew interest from national newspapers. His client list now includes Marvel Comics, Hit Entertainment, Mercedes-Benz, Thomas the Tank Engine, A1 GP World Cup Motor Sports and many more. Mellia’s artwork has even attracted royalty. The late Princess Diana owned a piece of his art and Queen Elizabeth has reportedly acquired a Thomas the Tank Engine painting. More recently, the Saudi royal family have also expressed an interest in his work. The artist has turned his attention back to automotive themes and we are pleased to offer his art through Car Art. Paul created a special canvas of the South African A1 Grand Prix car embossed with the image of Nelson Mandela’s 46664 logo. This painting was auctioned live on Sky Sports TV at the Durban race and the proceeds donated to the Nelson Mandela Foundation. Commission Paul to create a unique painting for you!